In March this year I was invited to speak at a conference in Paris. It wasn’t an unqualified success, there being no translator and my French being fine for chatting in a bar but not really up to presenting at a conference. However the nice people at the Ecole Nationale Supérieure d’Architecture de Paris-Belleville agreed to pay for my hotel for a second night giving me a whole day to myself with the city to explore with the help of a vélib. The notes below are transcribed from my note book and were written in a bar just outside Gare De l’Est. The maps are from the sequence that we are producing for the Climax City Project. A March saturday in Paris, unseasonably warm, taking full advantage of the Pari-bike scheme to undertake a bit of psycho-urbanism. Starting from Montparnasse and travelling via the Eiffel Tower to the Bois de Bologne then back across south of Sacré-Coeur to the Grand Boulevards and St. Denis. Then weaving through the tourist crowds across Île de la Cité to the Rive Gauche and back up the hill to Montparnasse. A route that I will measure on Google Earth when I get back to an affordable Internet connection (15 miles). The first thing you notice when cycling in Paris is that it is really quite hilly, there is a third dimension that doesn’t come out in the urban design analysis. The Arc de Triomphe sits on top of a hill that is really quite steep when you approach it from the river – must try and get a contour plan to add to our mapping. The other thing that you notice is how absolutely beautiful it is! It is no false claim to to say that it is the most beautiful city in the world, but less easy to work out quite why this is. As you cycle around you constantly come upon set pieces that have been planned – the vista along a boulevard, the six pointed Étoile, the formal park or promenade. But the city’s beauty lies in the interaction between these set pieces and the organic chaos of the older city which reasserts itself around every corner. The European norm is for a dense organic old town and a modern (relatively speaking) brash extension of avenues and Boulevards. Barcelona and Milan are particularly stark examples, but this arrangement is the norm in many continental cities where the old town was extended to create a new planned district. Freed from the restrictions of existing buildings and ownerships these ‘new towns’ are grandiose and impressive but they don’t have the richness of Paris. 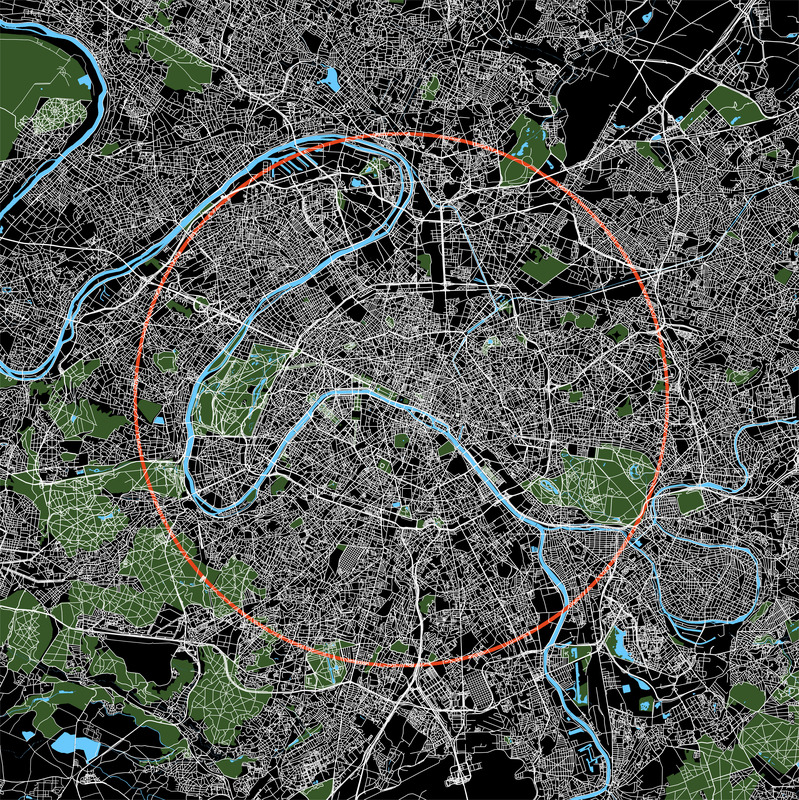 In Paris generation after generation of urban designers have tried to impose order on the unruly city. They have sliced it up with new streets straight as a die, radiating from grand six pointed junctions (les Étoile), squares and parks. Some schemes have failed like the great masterplan for Temple that Eric Hazan describes in his book The Invention of Paris: A History in Footsteps although echoes of these plans can still be found if you know where to look, as Hazan does, in the angle of a street or the position of a small square. However many of the plans were realised by fiat of King or Emperor and still have the power to take your breath away when a vista suddenly opens up. The city is a collection of these set pieces, rather than a coherent plan, and within a few footsteps of the grandest formal urban composition can be found a tight medieval street that predates it all. We have this idea that it was Haussmann who masterplanned Paris, but in fact he was just one of a long line of a planners who have sought to put their stamp on the city. They take their place alongside those who built Paris’s five sets of walls, the engineers who cut her canals and the paysagistes who laid out her parks. London is a similar mix of the planned and the organic but in the chaotic free market (if you are French) freedom and democracy (if you are American) of London the organic generally wins. The unstoppable force of the market and the inalienable rights of land owners have thwarted attempts at grand planning line Wren’s masterplan for London after the Great Fire. Further more, when grand planning was tried, be it in Bloomsbury or Knightsbridge, which were laid out on estates at the edge of the city, they were designed in an anti-grandiose fashion, grandiosity being very un-English. So London is an organic informal city for all its planning, while Barcelona and New York are planned cities for all their riotous growth. 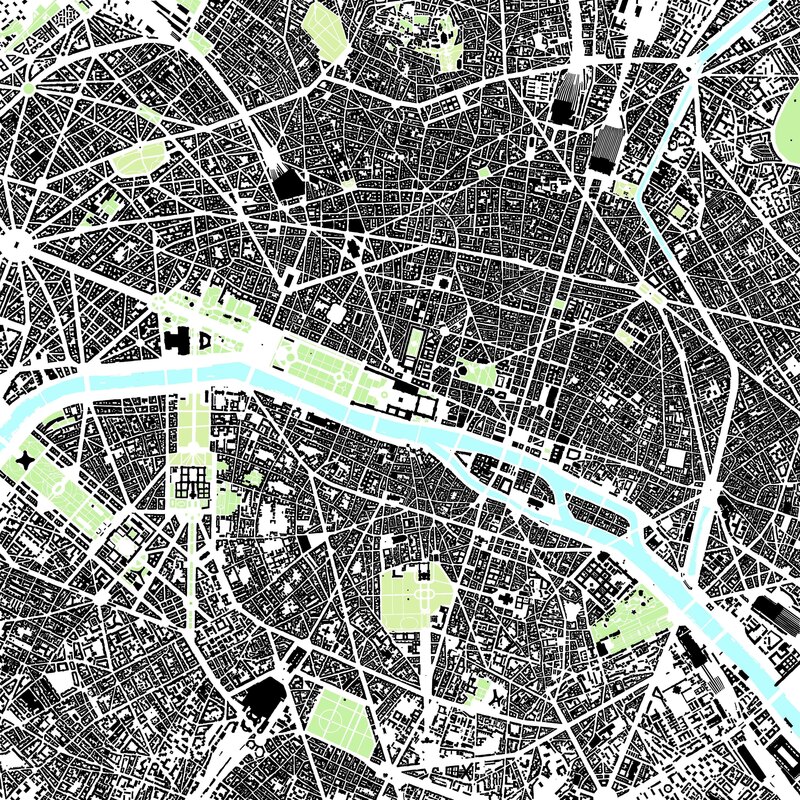 Paris by contrast stands at a point of balance between the organic and the planned. Its effortless urban set pieces took great effort to impose on the unruly city. They required the power of a centralised state – absolute monarchy or emperor – set against a teaming riotous urban population. Not necessarily a model to be emulated but the formula for a beautiful city. 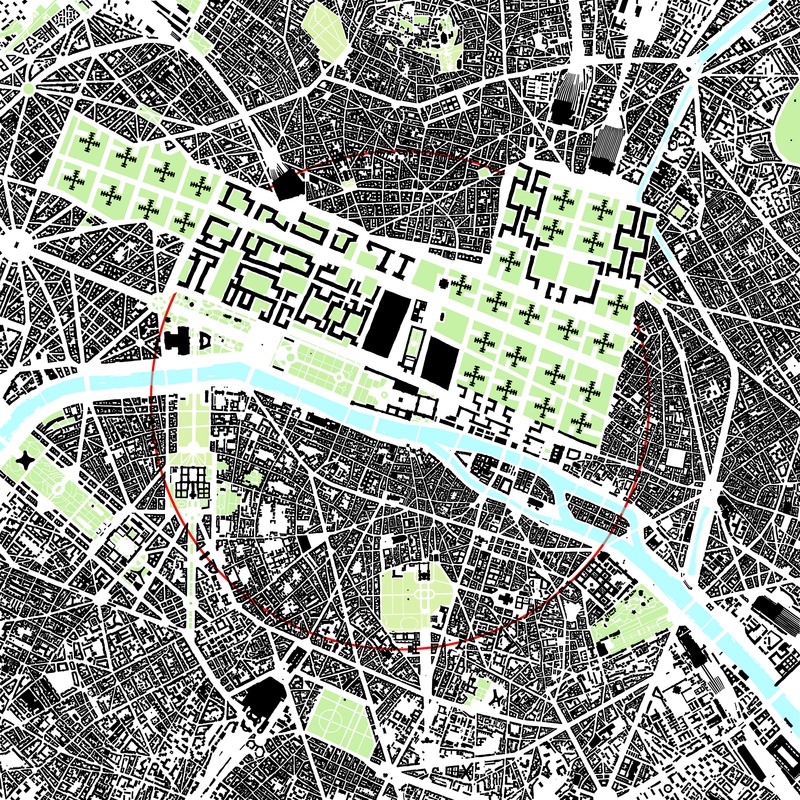 Paris at three scales: A Trellis plan (left) with a 10km circle, the 2km Figure Ground Plan (centre) and an 800m Tissue Plan (right). 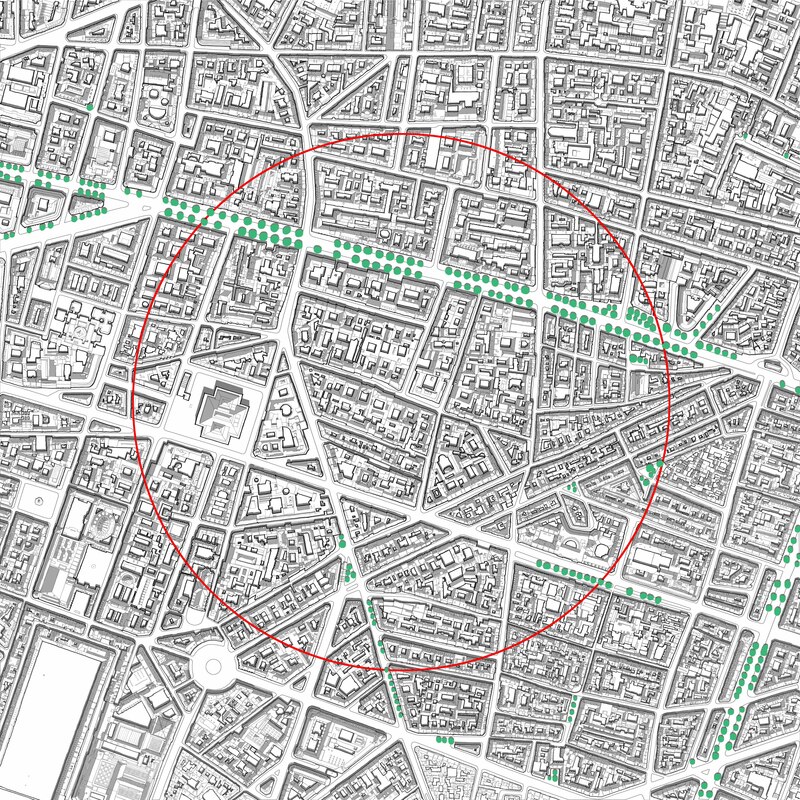 Categories: Uncategorized | Tags: cartography, Paris, Urban Design | Permalink. The Urban Renaissance Happened – its official! In the last couple of months census data has been published in the US and UK that provides evidence that the urban renaissance really did happen in the 2000s, as we predicted it would! In July William H Frey from the Brookings Institute published his analysis of US census figures to show that between 2001 and 2011 US cities grew by 1.1% compared to their suburbs which grew by just 0.9%. Not startling figures – I hear you say – but this is after-all the US, the country of endless urban sprawl. It is in fact the first time that cities have outstripped their suburbs since the 1920s and it happened in 33 of the US’s 51 metropolitan areas. Earlier this month the UK census figures were published for England and Wales so that we can compare and contrast. The extraordinary conclusion is that despite the credit crunch, the collapse of urban apartment markets and a deep recession, the cities in the UK’s six metropolitan areas (on the table above) grew by 10.6% between 2001 and 2001 compared to their suburbs that grew by just 5.6%. If that isn an urban renaissance I don’t know what is! Our book contains the above table of city populations in the UK from 1911. It is a sorry tale of urban decline that shows the haemorrhaging of population from inner London, Manchester and Liverpool. The other cities do better, particularly Birmingham and Leeds – partly for economic reasons and partly because their boundaries are drawn to include most of their suburbs. When we updated our book in 2009 we used mid census figures from 2006 to update this table. This was because they were the most up to date figures at the time. However there was apparently also a technical problem with the 2001 Census (that managed to lose 250,000 young men!). As well as being more reliable , the 2006 figures were also slightly more effective in backing up the central thesis of the book, namely that the turn of the millenium would herald an urban renaissance of a magnitude similar to the suburban explosion triggered by various factors at the beginning of the 20th Century. 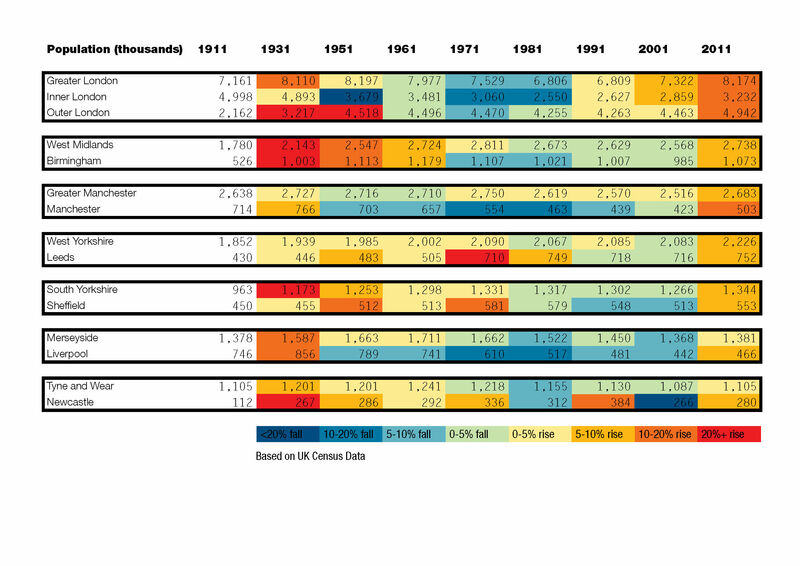 In the 2001 figures (shown on the above table) all the UK cities outside London were still shrinking. In the five years that followed to 2006 they appeared to have stabalised (plus or minus less than 1%), the exception being Manchester which had grown by 2.1%. We concluded tentatively that a century’s worth of urban decline and suburban sprawl had finally run its course and that while not yet growing, UK cities seemed to have turned a corner. In this light the 2011 figures paint an extraordinary picture. They were heralded in the Manchester Evening News with the headline ‘Boom City’ prompted by the growth of the city’s population by very nearly 20% in a decade. Inner London had grown by 13%, Birmingham by 9%, Sheffield by 7% and Leeds, Liverpool and Newcastle by 5-6%. Overall the 6 metropolitan areas in the table grew by 1.4 Million people a significant proportion of the 3.7M growth in the overall population of England and Wales. As to why this has happened, commentators in the US have cautioned against pronouncing the end of the suburb. They suggest that the sub-prime crisis has been mainly a suburban problem. As people struggle to get mortgages they are putting off having families and staying in their urban apartments. However they also concede that it is a function of economic trends that have seen jobs growth in urban areas outstripping the suburbs as cities become economic drivers. This we predicted in our book. We argued that demographic change (in which 80% of new households did not have children), environmental issues (such as the rise in fuel prices) and social trends (people seeking different forms of community) would combine with economic factors to create a strong pull factor to urban areas. At the same time the closure of polluting industries and the regeneration of many inner city districts would make cities much more appealing. There were many who argued that this was wishful thinking, which of course it was, it is just that some times wishes come true. The question now is whether these trends will continue at a time when the housing industry is retrenching and the UK government is toying with loosening the constraints on suburban development. In the book we concluded that the jury was still out on the robustness of the urban renaissance, the 2011 census figures give cause to be slightly more optimistic. Categories: Uncategorized | Tags: Population, Urban Renaissance, Urbanism | Permalink.